Making small towns into wonderful places to live and work will mostly proceed by improving conditions for walking. Improvements for cycling and public transport are probably an irrelevant distraction. A few days in Dorchester set me thinking about how small towns could wean themselves off car dependency, and become wonderful places to live – if they wanted to. There are hundreds of small market towns like this in Britain, though they don’t all have quite such a long history. 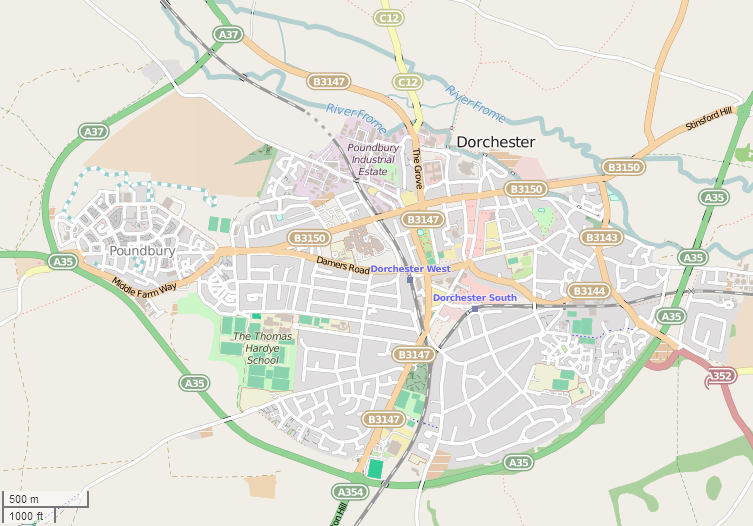 Dorchester was a Roman town, and is the traditional capital of Dorset, though its population is only about 20,000. The Romans have long gone, replaced by a pedestrianised shopping street, some car parks, an interesting range of Victorian-and-older houses, and some tree-lined walks. Outside the pedestrianised centre, you soon realise that the car is dominant. Streets are mostly quite narrow, but have a steady flow of traffic, and guardrail and indirect crossings to keep pedestrians in their place. Turn the wrong way, and you’ll find an oversized junction, probably giving access to a car park, or a roundabout built to minimise delay to motorists. The town is famous as the home of the Victorian poet and novelist, Thomas Hardy. He built himself a house on the outskirts of the town, and rather delightfully had a room just for bicycles, when they were the latest fashion (in the 1890s). The garden is now somewhat spoiled by noise from the bypass. You like to imagine that Thomas Hardy would still be riding his bicycle if he were alive today, but I’m afraid he’d probably have long since built a garage, and taken up driving. This is very different from an equivalent Dutch town. There would be a dense centre, with an inner ring road built on the former defensive canal. Car parks would be further from the centre. The first suburbs would have been built later, with cycle tracks alongside the main roads into the centre. But the suburbs would be more extensive, reflecting the huge population growth in the Netherlands over the last few decades. There probably wouldn’t be an outer bypass, though there might be a motorway fairly close by. There wouldn’t be a Tesco (or any other large food store) on the bypass. The normal way of getting about town would be by bicycle, though quite a lot of people drive. We can’t magically convert a British market town into its Dutch equivalent – the urban form, street form and land use structure are completely different. We can’t just look over the North Sea and copy what the Dutch have done. We have to find our own way. It’s not even clear that the people of Dorchester want to change. Traffic congestion isn’t really a problem, and driving is convenient. Those who don’t have access to a car are at a disadvantage, but that’s probably a minority. There is a bus service that loops around the suburbs once an hour, but it’s almost exclusively used by the elderly. People living outside Dorchester will be even more dependent on the car. So seriously restraining the car is unlikely to be popular. The small-town Italian model would be to restrict parking in the centre, giving bikes a significant advantage. 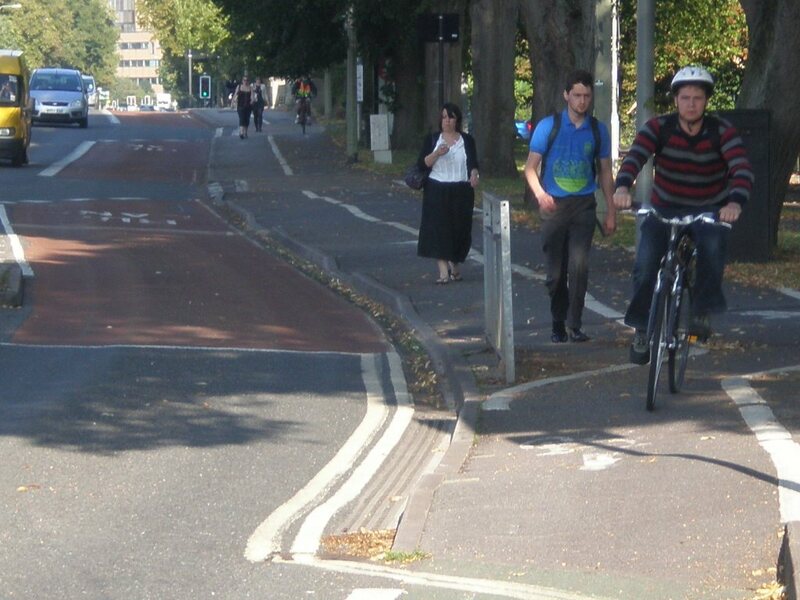 But it’s unlikely that Dorchester’s residents would be quite so keen to cycle, because the culture has been lost, and the streets have been adapted for the convenience of motorists. Dorchester also has some hills, in stark contrast to the Po Valley. So if we can’t restrict traffic very much, our only real option is to minimise its impact, by reducing speeds, and giving greater priority to pedestrians. The whole town could be a 20mph zone. Some people will already walk into town, and some others might be persuaded out of their cars if walking wasn’t such an obstacle course. Remove the guardrails, and use Zebra crossings to give pedestrians priority. Not many people will cycle, but simply slowing the traffic will make cycling a bit more tolerable. In time this should reduce some of the demand for parking, as people walk instead. This might allow some of the most central parking to be converted into amenity space, maybe a new square with shops. Dorchester would become a more pleasant place to stop and walk around, and visitors would stay longer, recommend it more, and return sooner. In Britain’s market towns, where the level of cycling and bus use is minimal, it’s probably more sensible to focus on improving conditions for pedestrians, gradually reducing the impact of traffic. Shared-space roundabouts, road narrowing, and better pedestrian crossings, like at Poynton in Cheshire, might be the better approach, even though this isn’t particularly cycle-friendly. In small towns, we should focus on pedestrians. The railways should be given the role of coordinating Integrated Transport. Information about buses (and cycling and walking) needs to be considerably improved, so people can readily understand and begin to trust the quality of connecting services. When I’m going to visit a new city, I look to find out how to get from the station to my destination – be that somebody’s offices, where I’m staying, a conference venue or the city centre. In a small city, I’ll probably just walk. If there’s obvious public transport – a tram or a metro, I’ll use that. It’s usually next to impossible to decipher the buses. If I’m travelling on my own and feeling adventurous, I might look up potential cycle routes. But failing that, I’ll probably resort to a taxi. Why is it that integrated transport is so good in some countries, but so hopeless in Britain? A large part of it is down to our lack of trams. 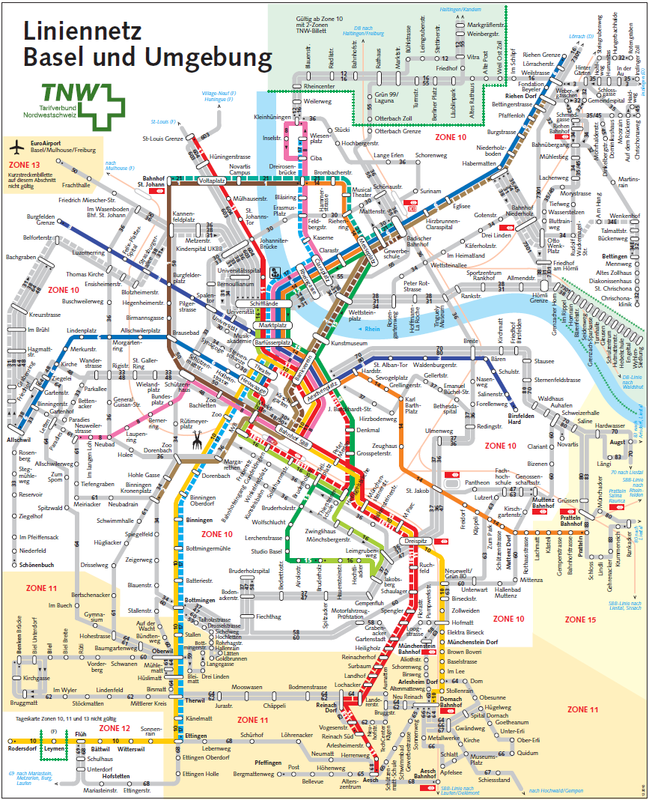 Tram and metro systems are generally simpler to understand, because the cost of infrastructure limits their complexity, and most routes have a good frequency. There is a strong tradition of diagrammatic mapping that people are used to, and which works well. 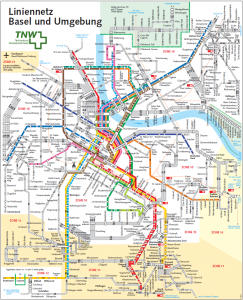 Because it’s a diagrammatic map, you do then have to go to the effort of finding your station/stop on a street map, but the diagrammatic map inspires confidence, and makes that worthwhile. 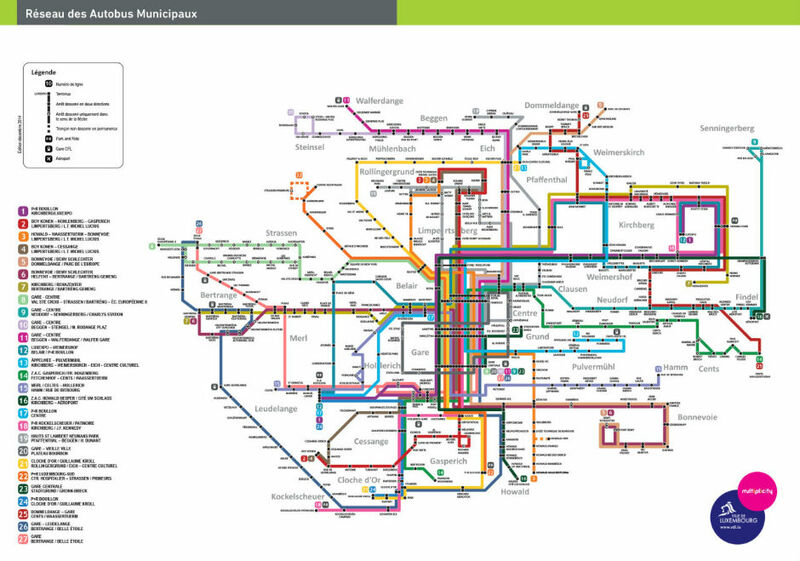 Here’s an example from Basel (there’s an even simpler version which just has the coloured tram lines, and leaves out the buses). Bus maps are generally more complicated. 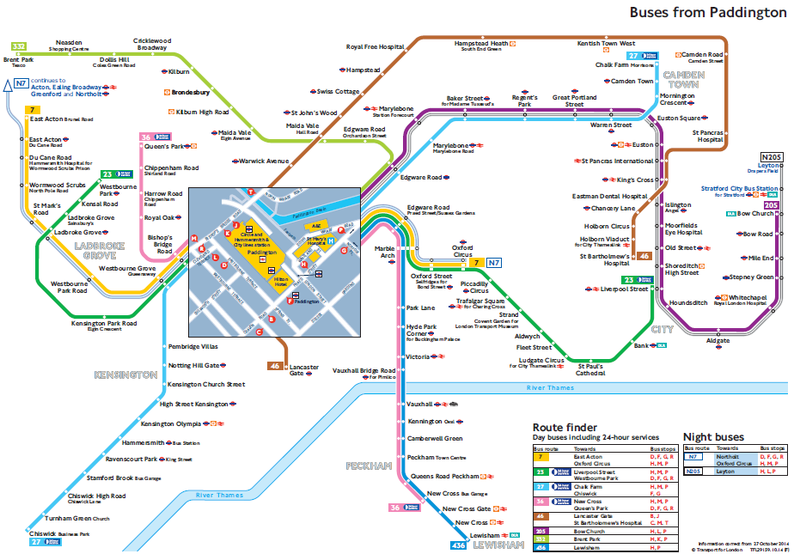 The norm in the UK is to use a different colour for each route in the suburbs, in an attempt to mimic metro maps, but to give up in the city centre. Buses often run in complicated loops in the centre, and if you have one colour per bus route, you would end up with multiple parallel lines, and an unintelligible tangle. Mostly, this type of map never sees the light of day, but here’s an example from Luxembourg. 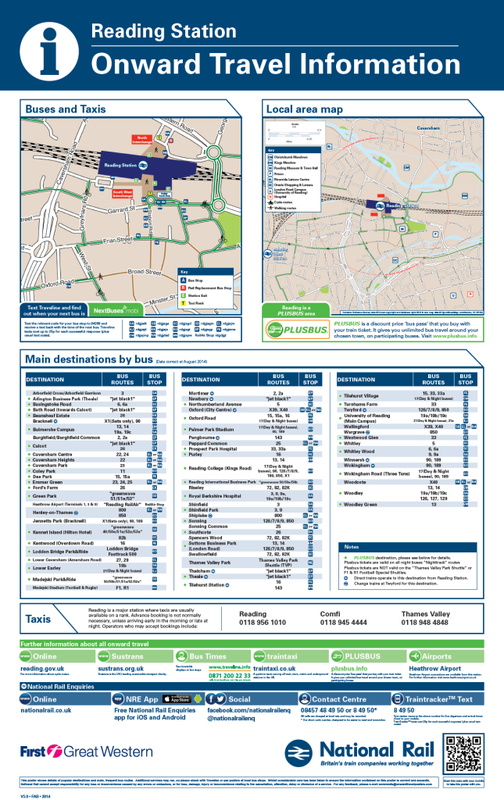 The best you can usually hope for in the UK is a central street map showing the stops, and a guide which lists the stops you can use for each destination. There might be another list that tells you how frequent each service is, but not how frequent they are in combination. You can work it out if you need to, but most people will have given up by then. Sometimes the city centre is just a mystery, like in Oxford. If I’m visiting a city, I want to know whether there’s a frequent service from near at hand to roughly where I want to go. British bus maps are mostly useless for this purpose. 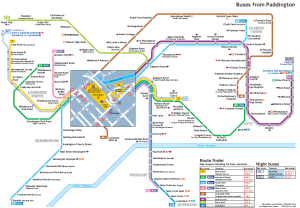 The best in the UK are TfL’s spider maps, which are produced individually for each small area, and rely on the fact that most services are high-frequency and planned as a system. Even these maps resort to destination lists and stop codes, so take a bit of deciphering. Here’s an example for the area around Paddington. 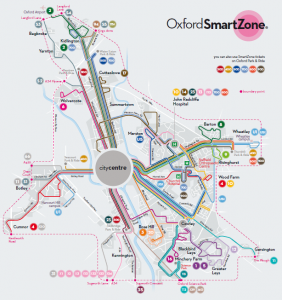 An alternative approach is to treat buses like low-frequency transport, and provide a journey planner. This will give you a list of departures, but it doesn’t give you a feel for how good the service is. It might tell you there’s a journey every few minutes, but they might take different routes, or involve changing in different places. The great thing about a map is that you can see this straight away, not have to decipher it from a list. 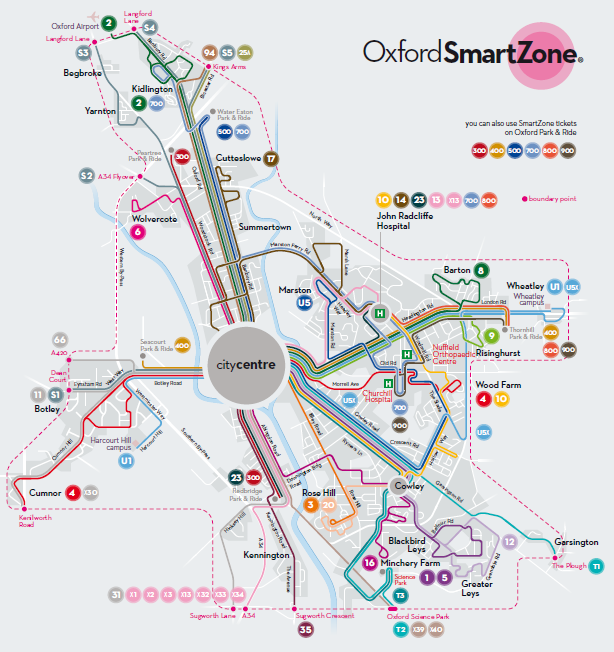 I’ve been developing a solution for my Oxford bus map, which is to use a small range of colours to show the routes that buses take in the centre. There are usually only a few distinct routes through the centre, which then spread out in the suburbs. I’ve limited the map to the routes taken by higher-frequency services, to keep it reasonably simple. Lower frequency branches in the suburbs are shown as dashed lines, to give a clear visual indication of where the quality drops. In this way, the central map blends seamlessly into the whole-city map, so it can be zoomable, and overlaid on a street map. Why can’t we get good information already? Well mainly because the private bus operators are focused on selling services from the suburbs to the centre, not on providing a service that works for visitors. Some operators provide excellent information, others little more than a printout of a spreadsheet. The councils have responsibility for public transport in general, but are very patchy in the information they offer. Mostly they have subscribed to providing journey planners to discharge their basic responsibility, and left the private operators to provide further information. This is why I think the responsibility for Integrated Transport needs to be formally given to the railway. The railway already takes on part of the responsibility, but it’s still rather patchy. The railway companies are the key beneficiaries of good integrated transport – they are the ones that get the income for the majority of the journey. So the railways are best placed to make a system that works well for visitors. Integrated transport is mostly about information. In an ideal world, the bus companies would be improving their connecting services, and the local authorities would be improving conditions for cycling and walking. But for the moment, it is mostly a matter of providing the information, good and bad, and letting travellers choose accordingly. When we can easily see the good examples, there will be more incentive for improvements to be made. In recent years, there’s been a lot of enthusiasm for providing bike parking and bike hire. In countries like the Netherlands, there are huge cycle parking facilities at stations, and the two modes definitely complement one-another: 40% of train trips in the Netherlands are combined with cycling. The railways certainly have an interest in providing cycle parking and cycle hire, because there is never going to be enough space for commuters to take their bikes on the train. So this is a significant part of the market, and it does need to be provided for. But unless the conditions for cycling in our cities improve dramatically, it’s hard to see cycling becoming a major choice for visitors. I think the emphasis needs to shift to promoting walking and local public transport. The NationalRail website needs to be much clearer about providing onward travel information, starting with walking. There should be a link to a zoomable street map for each station, perhaps as an icon next to the arrival and departure station, as on the Swiss Railways site. At the moment there is a link about three levels down which takes you to a pdf of the station information poster. While it’s good that these posters have been produced, they are unwieldy and a long way from best practice. Outside London and the major cities, the posters are very basic (in London and the major cities, they use TfL or PTE maps, which are slightly better, but still limited). The maps don’t give you any feel for what the city is like – the cartography is minimalist, and the cycle and walking routes seem to be almost random. They don’t really tell you whether this is the sort of station where you walk straight out into the city centre, or whether cycling is fairly safe, let alone where buses run. 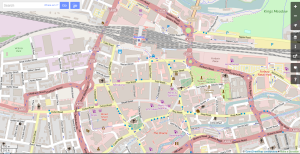 A proper zoomable street map would at least give you a feel for what the area around the station is like: are there major roads to cross, do you have to walk along a main road or cross at a major junction to get into the centre? Is there a pedestrianised area and shops close by, or is it industrial? Open Street Map already gives a good impression of this, though it could be improved (it doesn’t show pedestrian crossings, for instance). 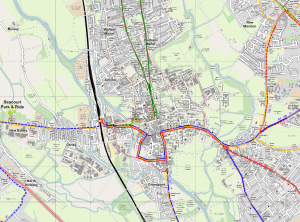 In the same way, you could have a map focused on cycling – one that shows where the routes are (not just odd bits of cycle path), whether there’s any provision on main roads, and whether you can cycle in the pedestrianised area. There can also be links giving more information on cycle hire and how it works. 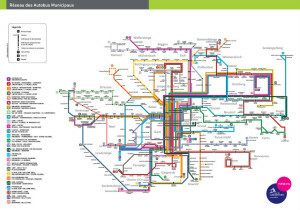 The biggest challenge is to map the central bus services, but that’s not impossible, as I have shown. Some of the TfL and PTE maps are pretty good, though they are often focused on taking you off to the suburbs, rather than getting about the centre. And of course, every map is different. 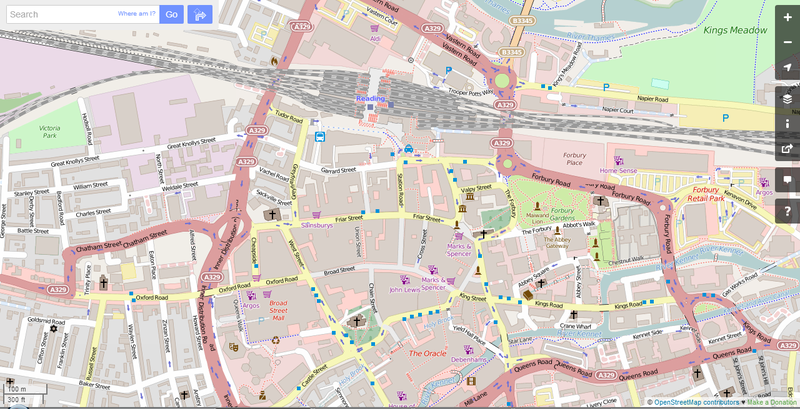 There needs to be a consistent zoomable map, showing clearly where services run in the centre. In the UK, I think the starting point is to make the railways responsible for providing good consistent readily-accessible information. We have the technology; all we need is an informed customer. For twenty years and more, cities like York and Oxford have had a transport hierarchy that puts pedestrians first. For those who manage not to be entirely obsessed with bikes or public transport, this idea that pedestrians have highest priority is pretty much accepted without question. But it isn’t clear what that means in practice. Over the years, I’ve seen several attempts to write a Walking Strategy, mostly trying to fill the gap next to the Cycling Strategy. Sometimes the language is copied, with talk of Core Pedestrian Route Networks. I often hear people trying to promote walking, with lots of talk of healthy physical exercise. Some people even encourage you to bribe yourself, with glorified calorie counters earning mince pies or ice creams. All of this seems to rather miss the point. I think the problem is trying to think of walking in isolation, in much the same way as providing for other modes has become stuck in silos. There really are things that can be done to promote walking – I’d highlight raised desire-line crossings of side roads and short-response pedestrian crossings – but they are only addressing walking in isolation. The wider issue is whether a street is the sort of place where people want to walk. Are there places to go? Are they within easy walking distance? Are there other people around? Is the traffic oppressive? Are people on bikes a threat? Are enough people being coerced out of their cars? In recent years, I’ve seen more talk of place-making. This is the idea that improvements to the physical form of the street can turn them into attractive places where people want to linger. While these are often great, and look wonderful, you do wonder whether you are just being taken for a ride by fancy-paving salesmen. There are an awful lot of streets that are unlikely ever to get such a treatment, so again it doesn’t feel like a real solution. Plain old tarmac is just fine if you’ve got people: the trick is getting the people. I think we need to break out of this idea of treating each mode in isolation, and promoting the ones we prefer. City streets are a single system, and you can’t treat one aspect in isolation. Instead, we need to refocus on disadvantaged user groups – such as pedestrians – and ask what they want to happen to the system as a whole. So, for instance, pedestrians might want more-frequent bus services, with better connections – because actually they’d rather not walk everywhere. They might want good cycle facilities on the road, so that people on bikes don’t threaten them, and maybe they’ll try it for themselves one day. They might want the traffic to slow down, or be stopped from driving through the back streets. They might want lots of zebra crossings, so they can enjoy stopping the traffic, and not have to wait in the fumes or the heat or the rain. They might want the parking moved a bit further away, so drivers don’t hog all the space by the entrance. They might want there to be less traffic. But pedestrians won’t want to stop the city functioning altogether. They’ll still want things delivered, still want disabled access, still want reasonable access by anybody really, just as long as the cars don’t take over. I think it’s time we learned to think like pedestrians. 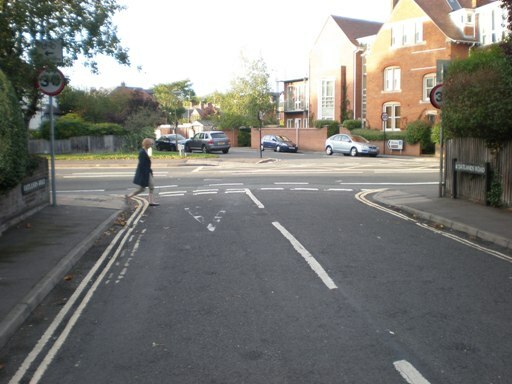 Slight humps at side roads mean that pedestrians can walk along the main road without breaking their stride. The gap in the double-yellows helps give a visual impression of continuity. A hump is cheaper than tightening the radius, because it avoids the need to alter drains. However it operates in the same way, because driving across a hump at an angle is uncomfortable, so cars slow down. Turning vehicles slightly disrupt the flow of traffic on the main road, reducing speed and making it more pleasant to cycle along. 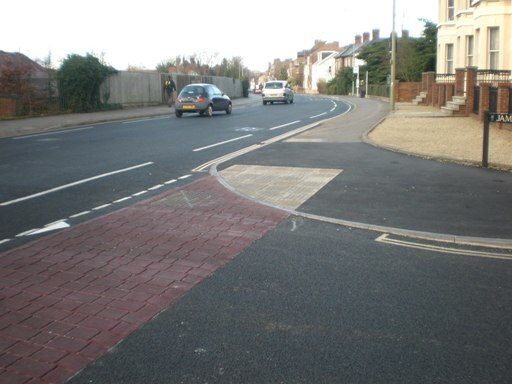 The cycle lane is painted across the side road because this reduces accidents. It also gives a strong impression of continuity to the cyclist. If side roads have tight corners, and speeds are low, you can walk along the main road without breaking your stride crossing side roads. You hardly bother looking backwards, and a glance tells you there’s no immediate danger. Often people don’t even look.